Michael Grondahl (left)|! !| Chris Rondeau (center) and Marc Grondahl (right). The last minute disclosure of a brotherly legal dispute might mar Planet Fitness’s $200 million initial public offering that’s expected to take place on Thursday. 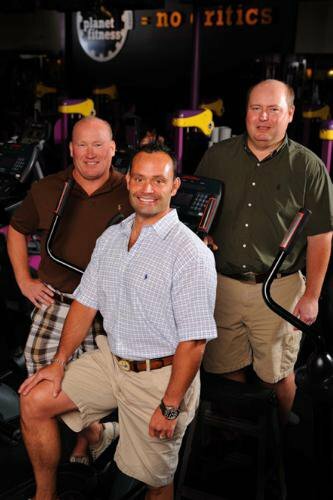 Michael Grondahl, who cofounded the Newington, NH company along with his brother Marc back in 1992, contacted the company via his lawyer on July 7, shortly after Planet Fitness’s intention to go public became public, according to a US Securities and Exchange Commission filing on Wednesday. Michael Grondahl, the former CEO, left the company back in 2013 just after most of it was sold to TSG Consumer Partners for about half billion dollars. Marc remained with the company, along with current CEO Chris Rondeau, who joined the company back in 1993. Michael Grondahl said Wednesdays’ filing “expressed concerns with the separation agreement” when he resigned, as well as the agreement executed in October 2013 when he sold his remaining holdings. The company said his claims are “without merit” and intend to “vigorously contest” them, although they have initiated arbitration procedures about the sale of his stock. There is no indication that a suit was actually filed. The company didn’t think that the dispute would have a material adverse effect on its financial results. Neither Michael Grondahl nor the company could be reached at deadline. Rondeau is expected to give out interviews the day after the IPO, but canceled his interview with NH Business Review because of “schedule changes” before the SEC Filing. The company also disclosed its preliminary second quarter results on the eve of the IPO. It estimates that it will report an income between $10 or $11 million, compared to $8.5 million in the first quarter and $9 million the same quarter of 2014. Revenues for the quarter are estimated at $78 million, 24.4 percent compared to the same quarter last year. That’s partly because the company has more stores. It’s now up to 1,014, with the last 38 coming in this last quarter. All but one of them is franchise owned. A year ago, it had 818 stores. Planet Fitness, which has more than 7 million members, expects the rapid expansion to continue, aiming to quadruple the number of gyms in the near further. The franchise expansion should occur mainly in the United States in the South and West and overseas, but it also could increase staffing at the company’s Newington headquarters, which currently employees about 200. In May, the company threatened to move its headquarters out of the Granite State unless the Legislature passed a law lowering the state tax burden on partnerships that go public. Lawmakers passed such a change, broadening it to include more businesses, but Governor Maggie Hassan vetoed it, though she offered to include some version of it in a compromise budget that would cost the state about $14 million. The proceeds of the IPO would mainly go to private equity firm TSG, as well as those who currently hold stock, including Rondeau and Marc Grondahl. Michal Grondahl doesn’t appear to hold any stock though some of the stores are leased to his real estate companies. The stock would be listed on New York Stock Exchange under the ticker “PLNT” for an estimated $14 to $16 a share. Planet Fitness shareholders will get about ten percent of a firm that is short on cash – about $27 million – and long on debt – about a half-billion, with a capitalization estimated to be as much as $1.5 billion.